In January, as part of the HAF team, project manager Said and interns Nisreen and myself, travelled from Marrakech to Fés and then to the Mideltarea. To learn about our first days in Fés, have a look atour former blog articles. On January 17thwe went to Mougeuer and TiteNali, two villages in the Gourrama commune in the Mideltprovince, to watch the 7,100 fruit trees from the tree nursery in Fésbeing distributed to the local farmers and planted. At first, we gathered together with thefarmers and provided a discussion about the challenges the communities face and the needs they have. 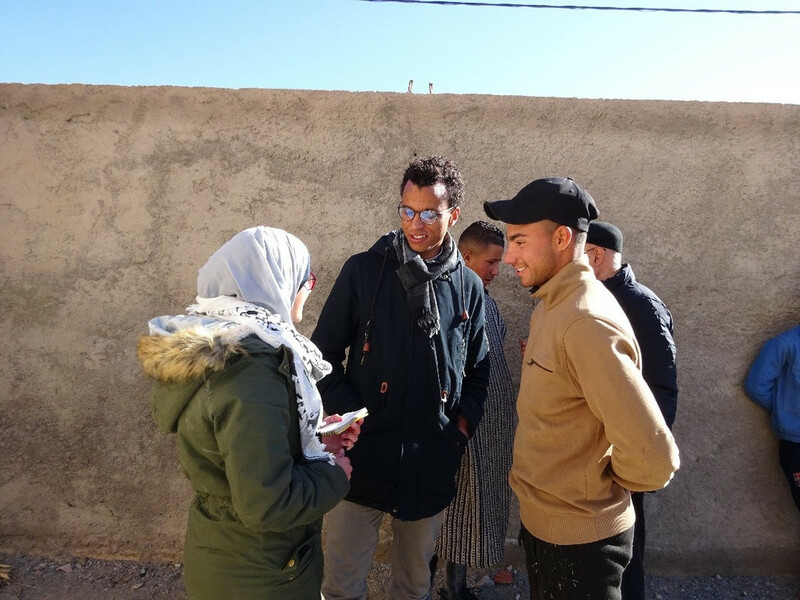 We were joined by Tarik from the local associations “El Karama” and“Mougueur-Zetouar du Development et d’ActionSociale” and by ProfessorAlami from the association “Experts Bénévoles” for development, in Fés.It was a bright day with a blue sky and the cleanest air I’ve experiencedfor a few weeks. Many people raised their voice and expressed their needs. They told us that they have tremendous problems with flooding and erosions, that electricity for pumping water is very expensive,that some of their fruit trees are sick, that they face a high unemployment rate and that the youth do not have a place to play soccer or to do activities together. What was mentioned the most, were the challenges with the consequences of flooding and erosions. For example, bridges where pulled down, huge stones ended up on the fields, so farmers cannot grow crops there anymore, for several months the children werenot able to go to school, because their paths to the schools were flooded. One of the village elders raised his voice too. He was wearing a grey Jelaba, beige shoes, hehas a white beard and a friendly expression on his approximately 70 years old face. He gave a long speech and the others expressed their agreement with nodding and with their voices. He didn’t only speak about the challenges, but also about their needs and ideas for solutions. To fight erosion the community plans to build terraces and to reforest their lands so the soil holdstogether. Furthermore, they would like to install solar pumps instead of using the electric ones to pump the drinking and irrigation water. He also mentioned that children need to walk too far to school and that they at least need to build a bridge, so the kids have a safe way to school. 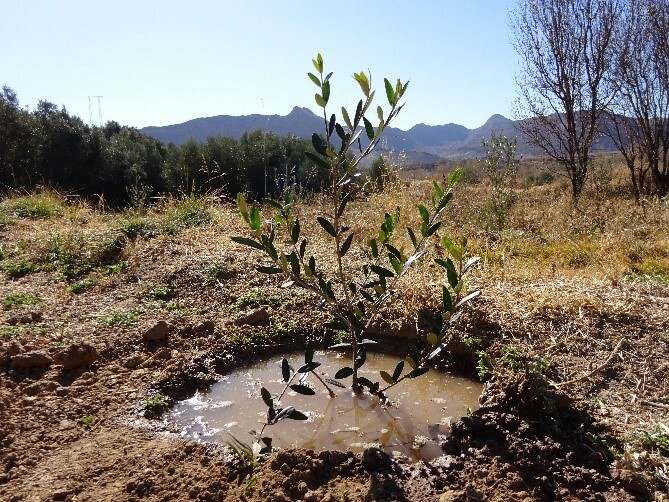 Others also spoke about the sicknesses their olive and almond trees face and that they are striving for solutions. A representative of the youth also took the chance to speak and expressed the youths wish to have a place where they can gather together, plan activities and play soccer. He also said that the school bus has not enough space for every student and that many young people leave to the village to study at the universities in bigger cities like Errachidia. A young man from TiteNali, who holds a bachelor’s degree in environmental geography raised his voice by saying that protecting the environment is of utmost importance. To fight the problem of erosion, people donot need to build expensive things like gabions, but should rather reforest their lands. Another problem which needs to be solved is, according to him, the pollution of water and the sanitary systems which lead to dirty water in the ground and pollutes the ground- and drinking water. He is against using fertilizers who as he says, damage the environment. He promoted organic agriculture instead. This seems to be an important topic; many farmers start to get into the discussion. This young man himself received 200 fruit trees on that dayto plant them on his 2hectares of land. 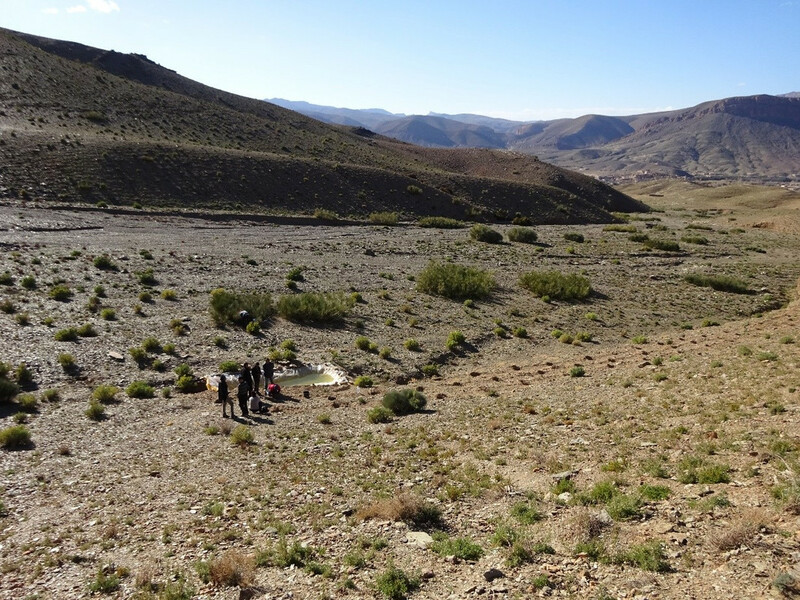 Later we visited his sites, which are quite far away in the mountains in the middle of a beautiful landscape. To see where the trees found a new home, we also visited the fields of other farmers and did monitoring there. 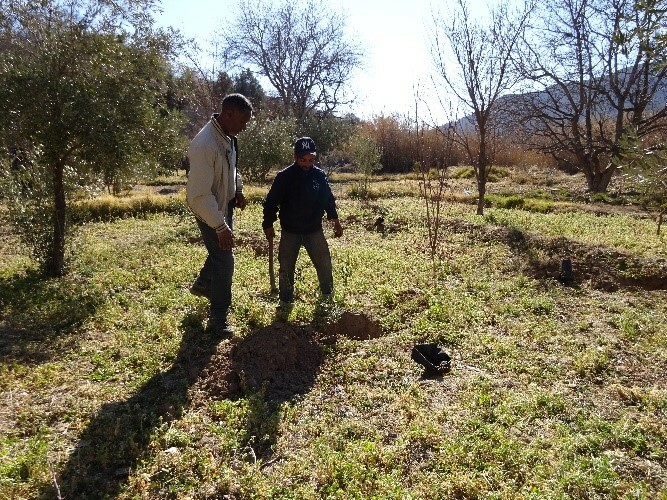 For me personally, this was a great experience because I got the chance to see how agriculture works in this rural area of Morocco. This afternoon and the next morning we spent by walking from one field to the other, again surrounded by the beautiful nature, the mountains, the clean air and the quietness of the countryside, accompanied by men from the local association and by local farmers. 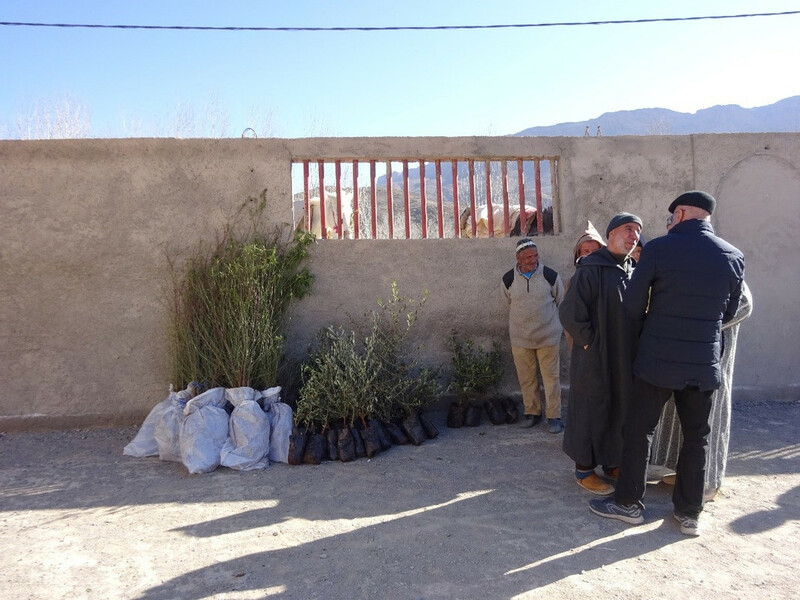 We saw the first trees, which were grown in Fés by the tree nursery at the ChildrenProtection Center with funding from ECOSIA (the search engine that plants trees), being planted in this great scenery. Here they will continue their living by, in a few years, providing a sustainable income for the community with the fruits they produce, which can be sold on the markets, and by protecting the environment, holding the soil together against erosions, with producing oxygen and filtering CO2 from the air. The farmers also signed contracts, that those trees later can be part of the carbon credit project and like this, they will generate income for the community. …where the trees found a new home! We also got the chance to see a corn mill which runs with hydraulic energy and an olive mill and oil press. I grew curious and learned a lot from our host Jamal who explained to me the processing. 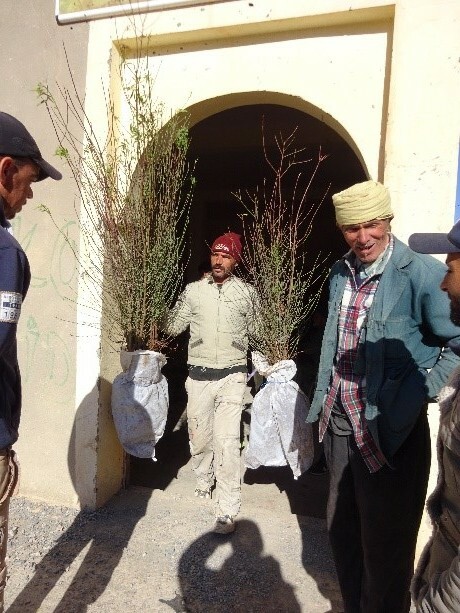 During my weeks in Morocco, I realized the value of the work such local associations do. I am eager to get to know more about their work and about what kind of people they are. The local association is working hard on fulfilling their goals to prevent migration to the cities. 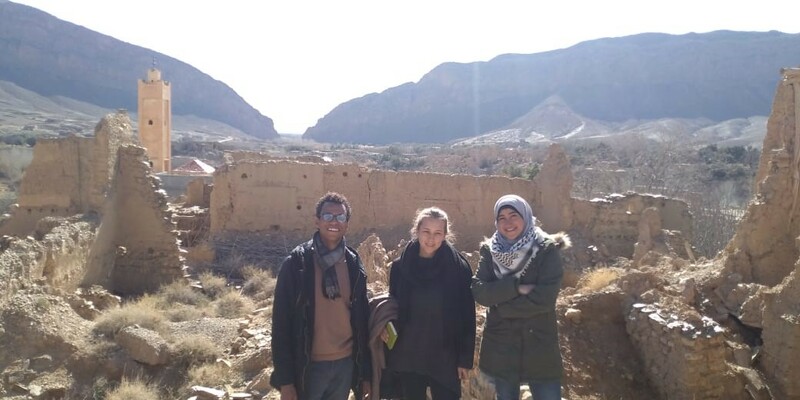 To encourage tourism in this area, they already started to repair a huge, old and beautiful Kasbah, they already have the rooms for a museum and are collecting traditional and local objects, and they are planning to launch a guesthouse in the village. They say, like this, tourists can benefit from the beautiful landscapes and nature and the community can benefit from the income this would provide. Broader, the local association has plans to work on improving education for the children and agriculture. The days we spent in Gourrama were shaped by rememberable breakfasts, lunches, dinners, tea breaks and last but not least, inspiring and thoughtful discussions full of plans for the future! The evenings, we spent sitting in a room with an oven, being nicely warm, havingsoup and discussing with members of the local association and with local farmers. 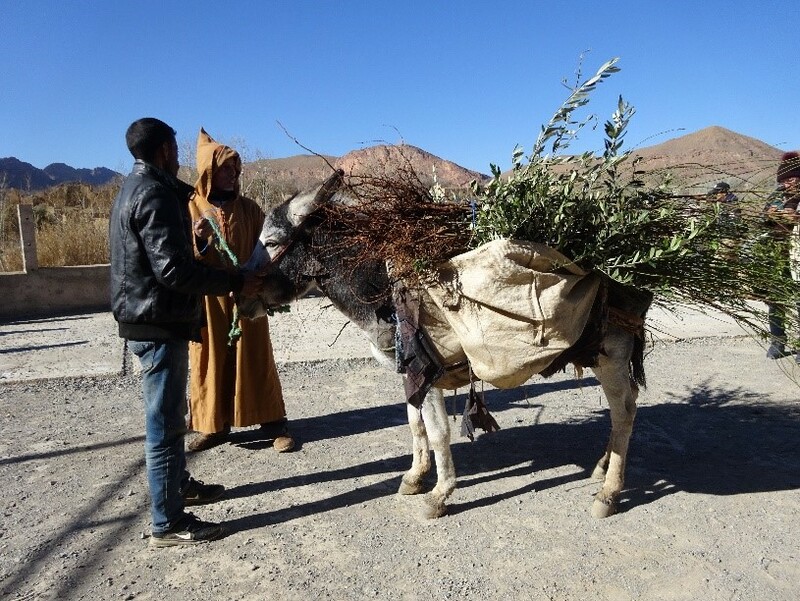 We learned that the tree distribution day was a special day for the villages and many people, who havenot visited the village for 40 years came back to be part of this event. We were wallowed in memories of the past and discussed ideas and plans for the development of Gourrama. 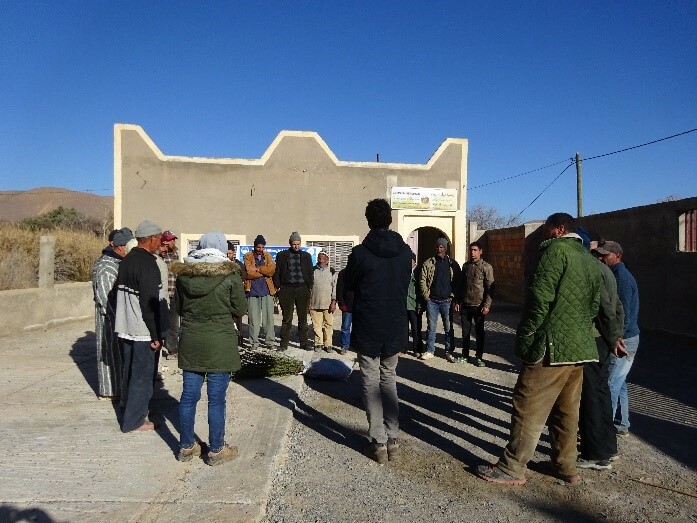 The High Atlas Foundation plans to work further with the communities of Gourrama by doing a participatory community mapping and a women empowerment workshop in the next months, InshaAllah.